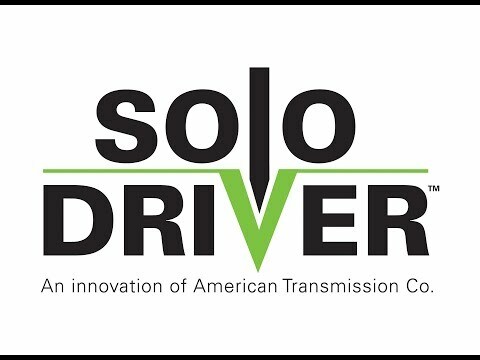 Solo-Driver™ | American Transmission Co.
American Transmission Co. is driving improvements in transmission line construction. Solo-Driver™ is a new, patent-pending method for installing foundations that is faster, more economical and more environmentally friendly than traditional installation methods. To date, the utility industry has relied heavily on two methods for installing transmission structures when a concrete base is not needed: direct bury and traditional vibratory installation. With Solo-Driver, now there is a groundbreaking third choice that uses a single piece of equipment to drive down costs and reduce impacts. Solo-Driver™ | An innovation of American Transmission Co.
1) Attached to an excavator, a vibratory hammer grips tabs affixed to a caisson. 2) The hammer lifts, rotates and drives the foundation into the ground. 3) Then, the hammer grasps a tab on the top of the caisson to drive the foundation to the required depth. Solo-Driver is three times as fast as other methods. It requires half the crew of direct bury and traditional vibratory installation methods because additional setup work is not required. Since the crew does not need to manually maneuver the caisson, Solo-Driver greatly reduces the risk of crew injury. Safety interlock jaws on the hammer prevent the caisson from being dropped during installation, even if power is temporarily lost. Solo-Driver requires significantly less equipment than other methods, needing just one excavator for installation and no power pack, since the hammer runs off excavator hydraulics. Solo-Driver also requires half the overhead clearance of other methods. Less equipment means less weight, resulting in minimal ground disturbance and environmental impacts. The lighter equipment is also much kinder to wetlands. Minimal restoration is required after installation, and there are no spoils to remove. Initial field studies have shown Solo-Driver is much less costly compared to traditional installation methods due to reduced labor costs, reduced equipment costs and reduced project risk dollars due to a smaller construction window and expedited timeline. Read the white paper for more details on how Solo-Driver is driving improvements in transmission line construction. American Transmission Co. is a Wisconsin-based company that owns and operates the electric transmission system in portions of the Upper Midwest. Solo-Driver is just one piece of ATC’s commitment to innovation, efficiency, the environment and excellence in transmission. ATC is the country’s premier energy delivery partner, and Solo-Driver is one of many resources available to utilities who partner with ATC. For more information about Solo-Driver, or to learn about how a transmission partnership might work, contact us.